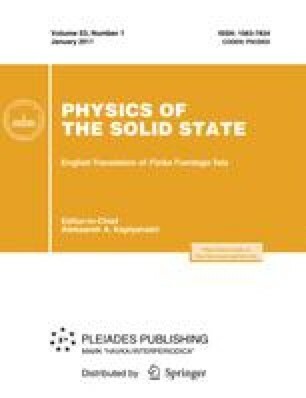 The dependences of the electrical conductivity and thermopower on the size of grains in a nanocrystalline material based on Bi2Te3-Sb2Te3 solid solutions of the p type have been investigated theoretically and experimentally. The relaxation time in the case of hole scattering by nanograin boundaries in an isotropic polycrystal has been calculated taking into account the energy dependence of the probability of tunneling of charge carriers and the dependence of the scattering intensity on the nanograin size L n . A decrease in the probability of boundary scattering with an increase in the energy of charge carriers leads to an increase in the thermopower. The dependences of the thermopower and electrical conductivity on the nanograin size, which have been obtained taking into account the boundary scattering and scattering by acoustic phonons, are in good agreement with experimental data. For the material under consideration, the thermopower coefficient increases by 10–20% compared to the initial solid solution at L n = 20–30 nm. This can lead to an increase in the thermoelectric figure of merit by 20–40%, provided that the decrease in the electrical conductivity and the decrease in the lattice thermal conductivity compensate each other. Despite the absence of a complete compensation, it has been possible to increase the thermoelectric figure of merit for the samples under investigation to ZT = 1.10–1.12. Original Russian Text © L.P. Bulat, I.A. Drabkin, V.V. Karataev, V.B. Osvenskii, Yu.N. Parkhomenko, D.A. Pshenai-Severin, G.I. Pivovarov, N.Yu. Tabachkova, 2011, published in Fizika Tverdogo Tela, 2011, Vol. 53, No. 1, pp. 29–34.